Built by the Romans during the first century in Belgian Gaul, Tournay experienced most of its growth along the Scheldt river. Unfortunately, the river also contributed to its troubles, because in 881, the Normans traversed its watery path, and thereby easily captured the city. That act of aggression stunted Tournay's prosperity. This game invites you to participate in the reconstruction of the city, in order to establish a glorious era that will last for more than seven centuries. Help your district flourish by cleverly coordinating the work of the city's three domains: military, religious, and civil. Certainly the prestige of your buildings will brighten the entire city! 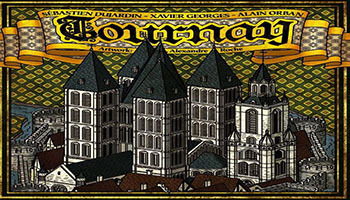 Tournay is a card game from the same designing team as the 2010 release Troyes with artwork once again by Alexandre Roche. 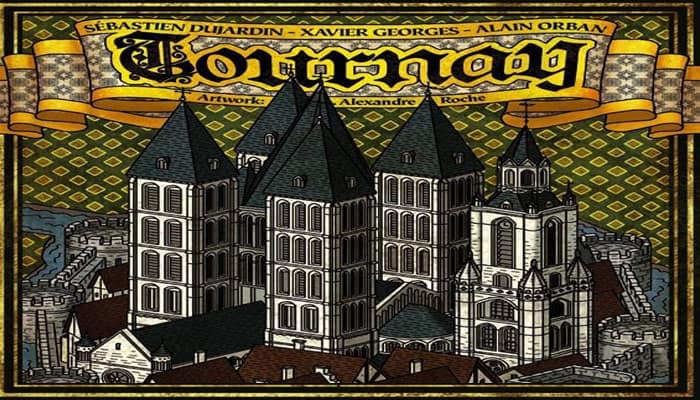 In this game, players manage a district of the city and its three classes of citizens. The cards are classified by level (I to III) and color to form nine distinct decks. Players initially have two citizens in each class that they will use each turn to carry out one of five available actions, such as drawing cards, or using the powers of their buildings. In each player's district, the building cards save them money, make more efficient use of the decks of cards, or recruit new citizens. The character cards optimize the use of buildings if properly positioned. It's up to you to create the most effective card combinations. Finally, constructed prestige buildings will give you valuable prestige points, depending on how your district has developed. But beware: Your opponents will also benefit from every prestige building you build! Note that an expansion is included in the base game's box, so advanced players can add still more replay value to this dynamic game!